Universalism in its primary meaning refers to religious, ethical, theological, and other philosophical concepts with universal application or applicability. 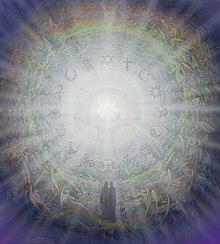 Religious or social alliances, communities or churches which call themselves Universalist often emphasize the universal principles of most religions and accept many aspects of other religions in an eclectic and inclusive manner, believing in a universal reconciliation between humanity and the divine. The mission of the Universalist church has been a double one, first to contravert the one-time prevalent idea of an endless hell. This part of the mission has practically been accomplished. … But the second and more important one awaits fulfillment … a fight which shall continue until the real, actual hells, before our very eyes, are destroyed. Those of us who are Gnostics believe that all people are ultimately saved and that God always loves us, no matter what we do. These beliefs are true, but they can very easily be simplified and misunderstood. God is never angry with us in the way in which a vengeful human would reject us, but God’s love for us has a dark side and one which we should rightfully fear. God loves us not in a sentimental way which aims at our ease and pleasure but, rather in a way which aims at our highest good and with an intensity which no one, even the highest angels, can understand.